For those of you who are looking for recipe inspiration, I have a huge set of files on Pinterest that I used to use when I wanted to try something new in the Cafe and now use for ideas for the CSA or just to try at home. My user name is LeslieCooks. I haven’t filed many of my own things there — I post them all right here, through my blog and just haven’t taken time yet to post them in Pinterest. But you’ll find loads of vegetarian files, then files under vegan-this and vegan-that when I started experimenting with veganism. During the summer for the CSA, I started keeping files by veggie — cauliflower, eggplants, etc. Recently I started a file of Instant Pot recipes. So after many years on Middle Eastern dishes, I’ve been pretty fixated on Indian food lately, and it really lends itself to the Instant Pot. I often find my recipes on Pinterest. A couple of weeks ago, I came across a page (through Pinterest), cookwithmanali.org. Her recipes are excellent — she has a Facebook page too, just for the Instant Pot. This week, I tried a recipe from Vegan Richa with a few changes for the taste buds of my family. As much as I love spicy food, Andy is kind of heat sensitive, so I had to tone it substantially. I also reduced the salt a bit. The dish was delicious, and Andy even went back for seconds and thirds. Add the peeled garlic, peeled ginger, Serrano pepper, tomatoes cut in half, cumin, turmeric, paprika and salt to a blender or Vitamix and blend until smooth. Cut the potato into 1″ cubes (I never peel potatoes) and the cauliflower into florets. Remember, any parts of the cauliflower you don’t use you can throw into a bag for use with other washed veggie scraps in a soup broth you make in the Instant Pot when enough accumulate). Set the Instant Pot to saute, add the blended tomato and seasonings and stir. Add the potato cubes, continuing to stir for a few seconds, then close the lid (if you have a clear lid to watch what’s going on, that’s great — I haven’t gotten mine yet). Cook the potatoes for 2 or 3 minutes until they soften a little. Add the cauliflower florets and stir. I actually added just a little water at this point and stirred it into the tomato sauce thoroughly to make certain there was enough moisture for pressure cooking. Hit Cancel. Reset the IP for High Pressure, 2 minutes, and close the lid and vent. I used to make this recipe in the Cafe, but it has been a while since I last pulled it out. My associate, Jame, created it for a group I was leading on healthy eating. I asked him to use kidney beans and brown Basmati rice in six different dishes so busy people could make all the rice and beans on the weekend and make up a quick dish with them each night of the week. His creations were fantastic! This is a delicious vegan Jambalaya, and I decided to resurrect it. Unfortunately when I went hunting for a picture, what I had wasn’t the best resolution — and I wasn’t 100% sure what stage the recipe was when I recorded it in my files. I mean, the ingredients and seasonings are all the correct ones, but I remember bumping up some of the seasonings and am not sure if that made it into the record. Anyway, here it is for now, and one day soon I’ll make it in a reduced size — and check the seasonings. In fact, now that I have an Instant Pot, I might just make it very soon and work out the times for that. If you try it before I do, let me know how it is and if you needed to make any changes. Thyme, crushed or ground, 1/2 tsp. Saute the peppers and onion with the garlic in the extra virgin olive oil until slightly softened. Add the remaining seasonings and sauté for a moment longer. Remove from heat. When the rice and kidney beans are ready, gently fold the beans and rice together with the peppers and onion. Serve and enjoy. When I got cold, working in a food trailer during the winters, I decided to move inside to work. For a while, before I opened my Woodstock cafe, I had a little concession in Caputo’s Fruit and Vegetable Market in Algonquin. Many of the staff used to come over to the counter and ask me to make up special items for their lunches. I use Italian rolls, whole wheat if I can find good ones, slice and toast them and set them aside. I cut up the peppers in 1-2″ pieces and toss them into a cast iron saute pan with some extra virgin olive oil and minced garlic, a little salt and some crushed oregano. I let them cook on medium heat, stirring occasionally, then add a little bit of white Balsamic vinegar and put a lid on the pan to let the peppers simmer until softened. While the peppers are cooking, I scramble some eggs gently in another cast iron pan and when barely cooked through, I remove the pan from the heat and push the eggs to its edge. (For a vegan alternative, scramble some tofu with salt and turmeric). When the peppers are finished, I arrange the eggs on top of one half of the bun, spoon the peppers over and voila! Egg and peppers sandwiches. I missed Lent this year, but when we started getting our peppers from Farmer Bob last week…and more coming this week…I thought longingly of those sandwiches and made some up last night for my family. They definitely got the all-out seal of approval, so I think I’ll make them again this coming week. 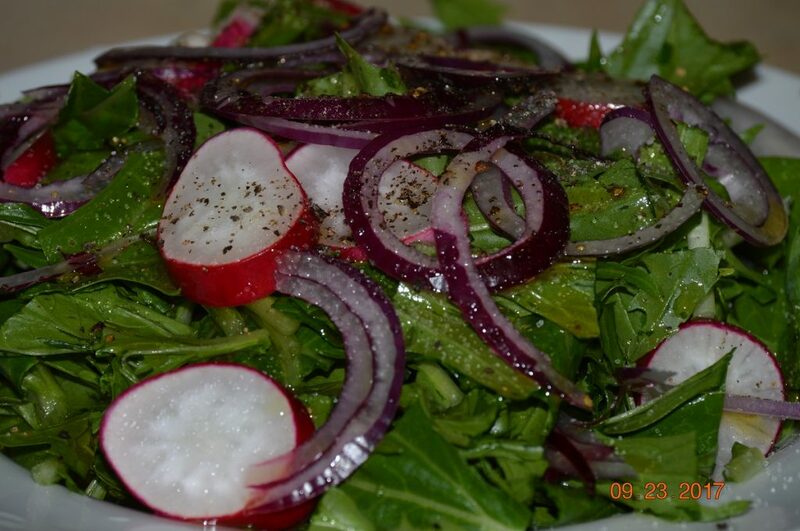 I also enjoyed this Asian greens, radish and red onion salad during the past week and I expect will enjoy something similar in the coming week with the lettuce we’ll get. I used a simple dressing of extra virgin olive oil, white Balsamic vinegar, salt and pepper. That white Balsamic vinegar is a new favorite of mine. I’ve always used olive oil and lemon for my salads, but the vinegar is a nice alternative. Finally, I’m gearing up for pickles. Farmer Bob is sending us all the basic ingredients for dills: pickles, garlic and dill. I only make refrigerator pickles, and they keep for months — deliciously. 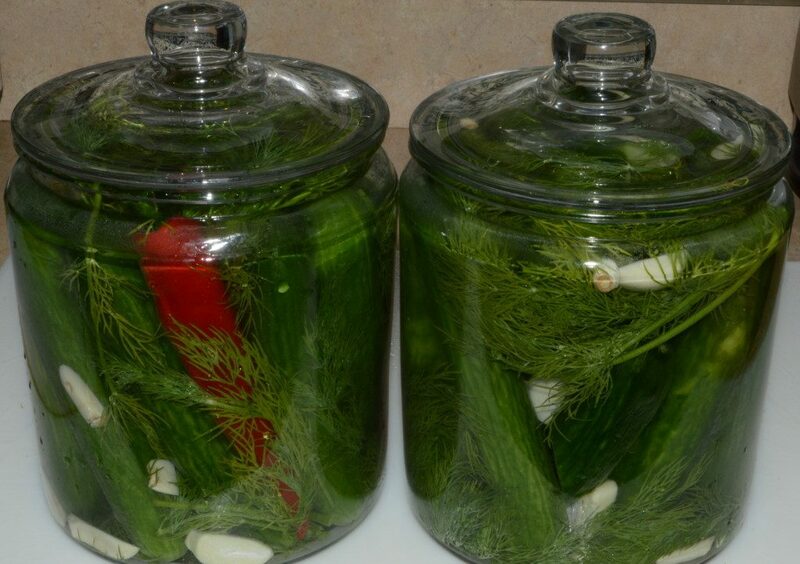 Wash the pickles and layer them with lots of cut garlic and dill into a glass or earthenware jar with a lid. Pour a cold broth over them made of 4 cups of water, 1 cup of distilled vinegar and 3 TB kosher salt. Refrigerate, and let them pickle for 2-3 weeks. If you like them spicy, add a cut habanero to the broth. Yum, can’t wait ’til mine are finished! Published in Bob’s Fresh and Local Farm Newsletter 9/6/2017. Remember the Pixar movie, Ratatouille? My grandson showed it to me a couple of years ago as part of his educate grandma project. I loved it! This week I thought it might be fun to try out their special version of ratatouille, called “Confit Bayildi,” created by Chef Thomas Keller. Confit Bayildi after cooking with extra sauce drizzled on top. Best to use a cast iron pan with vented lid. I was preparing three smaller portions so had to improvise. The difference between Chef Keller’s recipe and the ratatouille I usually make is mostly about technique and presentation. Ratatouille is a savory veggie stew, and it’s a must at the peak of the growing season since it uses everything: tomatoes, bell peppers, onion, garlic, summer squash, zucchini, eggplant, basil and/or rosemary. This special version, though, includes arranging the veggies for cooking and serving in concentric circles on top of a rich sauce, making a beautiful, colorful dish. ChefSteps has a Youtube video (https://youtu.be/iCMGPRiDXQg) that demonstrates the technique, which is great to know not just for Confit Bayildi but for other wonderful dishes like a crustless creamy apple tart. First select, wash and cut up your veggies, trying to choose veggies approximately the same circumference: zucchini, summer squash, plum or smallish tomatoes, eggplant. In the video, the chef peeled and cut the tomatoes by hand into thin, round slices, then used a mandolin for the rest. I cut them all by hand and didn’t peel the tomatoes since I know ours are organic, and I like eating the peel. Any parts of these veggies you don’t use should go into your blender along with lots of garlic, a cut up onion or two and a cut up red bell pepper or two. Add some extra virgin olive oil, salt and rosemary or basil, and blend until you have a smooth, thick sauce. Check the seasoning, making certain it is strong enough to carry the veggies. I like adding a little crushed red pepper as well. Spread the sauce at the bottom of a cast iron pan or other heavy dish, and arrange the cut up veggies rhythmically in concentric circles on top of the sauce: zucchini, summer squash, eggplant, tomato, then repeat. When the dish is filled, drizzle additional olive oil over the top, and sprinkle with salt. Cover with parchment with a steam hole so the veggies don’t stew, and bake at 350 degrees for about an hour. When finished, drizzle a little more extra virgin olive oil, sprinkle with fresh chopped herbs — and I squeezed a few drops of lemon juice over the top as well, which always seems to me to brighten the flavor. Finally, I drizzled remaining sauce over the top. I had some extra cut up veggies after I made this, so I made ratatouille soup, easy peasy. Just put lots of garlic and minced onion into a soup pot with extra virgin olive oil, and saute briefly. Add tomatoes and a little water, and simmer for a few moments. Add all the other cut up veggies and water to barely cover. I usually start with about 1 TB of salt to a gallon of soup and 1/2 tsp. hot paprika. I add chopped fresh herbs like parsley, basil or rosemary after the soup finishes cooking and I turn off the heat. Taste and reseason to your taste. Less or no water would, of course, give you the traditional ratatouille. Enjoy!